For other uses, see Polyxena (disambiguation). In Greek mythology, Polyxena (/pəˈlɪksɪnə/; Greek: Πολυξένη) was the youngest daughter of King Priam of Troy and his queen, Hecuba. Polyxena is considered the Trojan version of Iphigenia, daughter of Agamemnon and Clytemnestra. She is not in Homer's Iliad, appearing in works by later poets, perhaps to add romance to Homer's austere tale. An oracle prophesied that Troy would not be defeated if Polyxena's brother, Prince Troilus, reached the age of twenty. During the Trojan War, Polyxena and Troilus were ambushed when they were attempting to fetch water from a fountain, and Troilus was killed by the Greek warrior Achilles, who soon became interested in the quiet sagacity of Polyxena. Achilles, still recovering from Patroclus' death, found Polyxena's words a comfort and was later told to go to the temple of Apollo to meet her after her devotions. Achilles seemed to trust Polyxena—he told her of his only vulnerability: his vulnerable heel. It was later in the temple of Apollo that Polyxena's brothers, Paris and Deiphobus, ambushed Achilles and shot him in the heel with an arrow, supposedly guided by the hand of Apollo himself, steeped in poison. However, Polyxena was eager to die as a sacrifice to Achilles rather than live as a slave. She reassured her mother, and refused to beg before Odysseus or be treated in any way other than a princess. She asked that Odysseus reassure her mother as she is led away. Polyxena's virginity was critical to the honor of her character, and she was described as dying bravely as the son of Achilles, Neoptolemus, slit her throat: she arranged her clothing around her carefully so that she was fully covered when she died. Sacrifice of Polyxena near the tumulus of Achilles. Polyxena sarcophagus, c.500 BC. A few examples in Greek imagery can be securely identified as depicting the sacrifice of Polyxena. Most show Polyxena sacrificed over the tomb of Achilles. 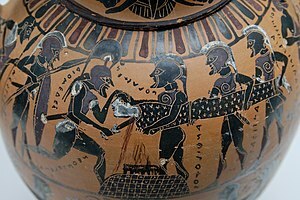 However, some details in the pictorial evidence of the sacrifice hint at varying and perhaps earlier versions of the myth. For instance, some images appear to show Polyxena sacrificed over an altar, rather than a tomb, and one sarcophagus relief, from Gümüşçay, the Polyxena sarcophagus, dated to c. 500 BC shows a tripod placed next to the tomb. These details have been interpreted as indicating an association between the burial mound of Achilles and sacred ground dedicated to Apollo. ^ a b Duckworth, George E (1976). "Polyxena". In William D. Halsey (ed.). Collier's Encyclopedia. 19. Macmillan Educational Corporation. p. 231. ^ Rose, Charles Brian (2014). The Archaeology of Greek and Roman Troy. Cambridge University Press. p. 79. ISBN 9780521762076. ^ Senvinç, N. (1996). "A New Sarcophagus of Polyxena from the Salvage Excavations at Gümüşçay". Studia Troica. 6: 251-64. Wikimedia Commons has media related to Polyxena. Chisholm, Hugh, ed. (1911). "Polyxena" . Encyclopædia Britannica (11th ed.). Cambridge University Press. This page was last edited on 28 December 2018, at 06:55 (UTC).